Manufactured by P.B.C. 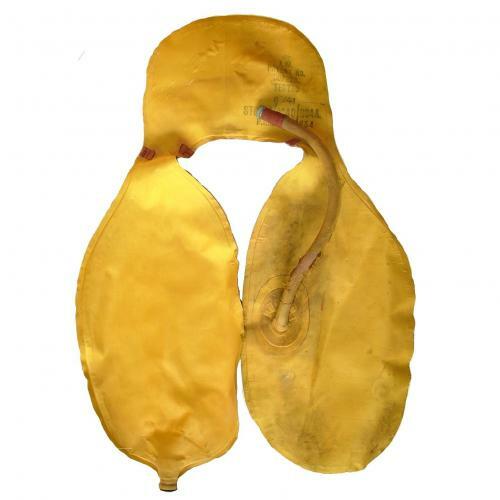 Gold/yellow silk covered version of the standard rubberized cotton stole (bladder) for the 1941 pattern Mae West. It is generally in good condition but the silk covering is stained in places and has some period patch repairs at the narrow points. This is a weak point on the stole and small edge splits are commonly found - see photos. The material of the main stole is very flexible, tube is equally flexible but the silk covering is coming away in places. The valve opens and closes reasonably freely. The rubber around the inflation lever/CO2 bottle oroface is slightly stiffened and cracked but will flex perfectly well should you wish to fit a bottle. No inflation lever or CO2 bottle currently fitted but these can be supplied separately if required. Air Ministry and King's crown marked with 8/41 date. This type of stole was primarily intended for tropical use but in practice were used in the European theatre of operations. They often seems to be associated with flap-type Mae Wests and this example was removed from a flap type belonging to a Spitfire pilot awarded the Distinguished Flying Medal. Brief details and a photocopy photo of the pilot will be supplied to the buyer. Considerably rarer than the standard stole. Stock code MW21979.